What’s ailing the Boston Marathon? Yesterday I ran the Boston Marathon. As my second marathon and first one in Boston it was an incredible experience. There were over 20,000 people who ran and close to 4,000 “bandits”–people who didn’t register but jumped in anyway. I saw people dressed as hamburgers, Lady Gaga and Sonic the Hedgehog! At Wellesley the students had signs that said, “kiss me I’m from Nepal,” or “kiss me I’m blond” as is tradition down the Wellesley kissing aisle (more commonly known as the Wellesley Scream Tunnel). And when I crossed the finish line I felt ecstatic. But despite the jovial atmosphere one thing plagued me–the amount of trash generated during the race. At nearly every mile volunteers handed out cups of water and Gatorade. Runners grab the cups, chug, toss the cups onto the street and keep going. It’s a great system for runners who don’t want to slow their pace, but generates an unbelievable amount of trash. It’s one race in one state but it’s a great start. And while these rules may be too strict for elite runners who are competing for world records, for the other 98% of us, I say bring it on. I was so focused on taking photos of trash that it slowed my time down! Completely worth it! 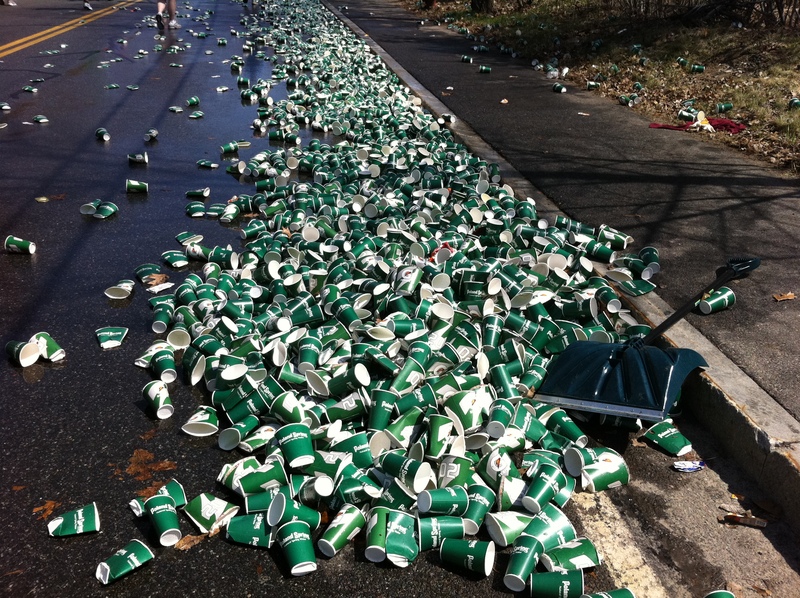 Don’t the cups become mush as people step on them? Yes actually! Since a lot of the cups were still filled with water they became a pulpy mess on the streets and the volunteers had to scrap everything up with shovels!